Nestled in the crystal blue waters of the Indian Ocean, the 115 small islands that make up the Seychelles are undeniably spectacular. With verdant, tropical forests and white sand beaches, it’s no wonder this remarkable archipelago is a well-known destination for an exotic getaway, and the perfect spot for a week or two of sunbathing on the beach and sipping on a cocktail. But what if you need a break from soaking up the sun? The Seychelles are full of exciting, cool, and picturesque activities that will ensure you have the time of your life. From National Parks and awesome water sports, to scenic cycle rides and a quaint capital city, here’s a few things you can do during your trip to the Seychelles. This beautifully unspoiled archipelago is home to a plethora of indigenous and endemic flora and fauna within its luscious jungles – you just need to know where to find them. The Coco de Mer palm tree is certainly one of the more well-known Seychellois plants, a rare and protected species that’s endemic to the islands of Praslin and Curieuse. The largest seed in the world, the Coco de Mer nut is erotically shaped, and can come at around 30kg in weight – so you’ll need to get out the big guns if you want to pick one up! You could even take one home – but you’ll need an export permit…and a bigger luggage allowance. So, where can you see these incredible palms and collect a Coco de Mer nut of your own? Vallee de Mai in Praslin is an amazing World Heritage Site and tourist hub that houses the largest Coco de Mer population, as well as a myriad of Seychellois animals. Get yourself a private guide and they’ll lead you through winding pathways that twist their way through the site, gradually ascending and descending through clusters of towering palms. Your trip here will be full of fascinating facts and tales, including an insight into the difference between female and male Coco de Mers, and the belief that this could be the original site of the Garden of Eden. You might even spot a rare black parrot, an elusive bird that swoops high up amongst the trees and only resides in Praslin. Our Tropical Sky Indian Ocean travel experts were lucky enough to find three, flying around each other in search for food. 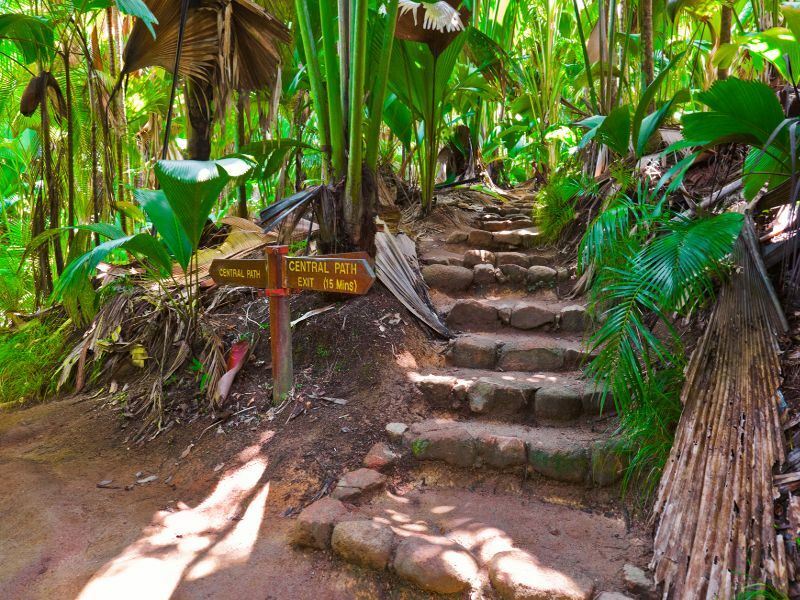 For a picturesque insight into Seychelles’ natural beauty, Fond Ferdinand in Praslin is a nature trail not to be missed. Much like Vallee de Mai, this small reserve is home to hundreds of Coco de Mer palms, as well as a plethora of other bright green plants and flora. Though excursions here are slightly cheaper than Vallee de Mai, this area still delivers an incredible landscape that is the perfect backdrop for a scenic afternoon walk. Don’t forget to pack water and sun cream though, it gets pretty humid and hot here. Love watching tropical birds swoop and glide amongst bright blue skies? Then you’ll certainly enjoy a trip to Aride Island. 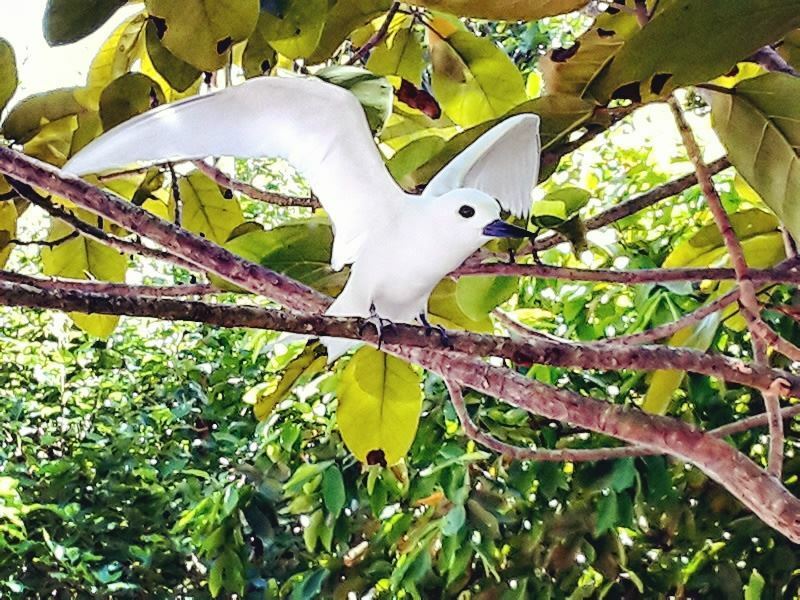 This incredibly beautiful nature reserve is known as the finest seabird island, and for good reason – it’s home to 18 species of native bird, five of which can only be found in the Seychelles. In fact, there’s more species of birds here than all of the other granite islands put together – crazy. Natural, unspoiled beauty is on the cards here too, giving travellers an insight into how the islands were 250 years ago before human settlement – a secluded, quiet paradise where travellers can become at one with nature. Look out for the indescribably pretty Fairy Tern, with its pristine white feathers and adorable features, or the Seychelles Paradise-Flycatcher, an endangered species with the most incredible, long tail of black feathers. Many Seychelles islands are also home to the Seychelles Magpie Robin, its black feathers contrasted with a bright white stripe, and the plump Seychelles Blue Pigeon with its vibrant red head. The Seychelles may be abundant in gorgeous birds, but there are plenty of magnificent animals on the ground, too. The giant tortoises that roam the islands are very popular amongst anyone who meets them – they are of course pretty big, with hard, majestic shells and the sudden ability to be able to move fairly fast when food is involved. Bird Island is a great choice for meeting these gorgeous animals – and this particular island is home to Esmeralda, a well-known 170-something year old tortoise with a lot of charm and popularity. Denis Island has a few large pens full of giant tortoises, waiting to be fed by travellers who flock to the island, and you can find out more about their history and personalities through the hotel’s nature tour. Toby, an 118 year old tortoise, is certainly the largest of the lot here. 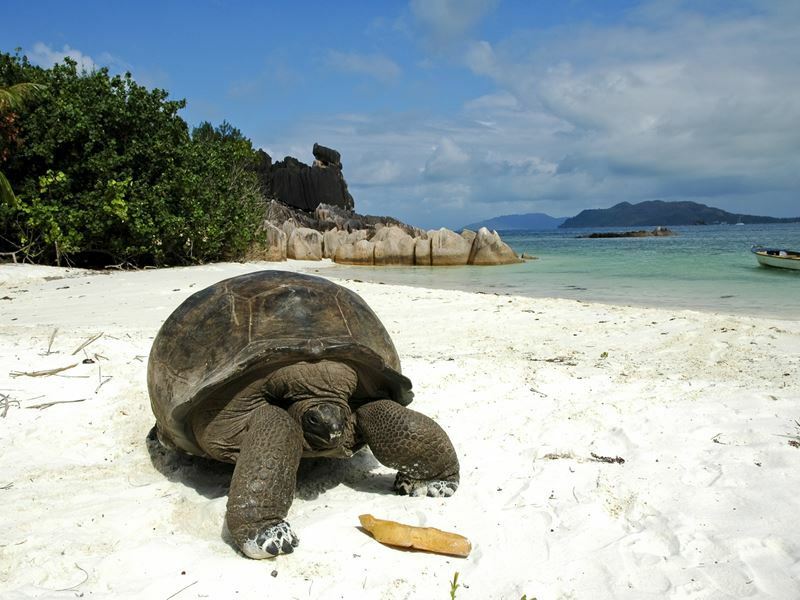 But, if you want to see hundreds of wild tortoises grazing in the shade, head to their native island – Aldabra, part of the Outer Islands. With so much indigenous nature, it’s no wonder the Seychelles are home to a few National Parks. For scenic, panoramic views of the Indian Ocean and the jungle-clad mountains, wander to Morne Seychelles National Park – home to Mahe’s tallest peak, Morne Mountain, heading here will grace you with one of the best views of the Seychelles, especially at the summit of Morne Blanc. Cloaked in lush forest, the park is also virtually deserted, save the tiny green frogs and harmless, slithering wolf snakes. This park is certainly best for a half or full day guided walk through soaring trees and thick bushes, witnessing the natural, unspoiled wonder of the islands. The beauty isn’t just on land though. The incredible, azure blue waters you see in the photos aren’t Photoshopped – they really are that bright, and they create the perfect spot to do a bit of snorkelling or diving. Crystal clear, with an abundance of impressive marine life including turtles and tropical fish and a warm temperature thanks to the beaming sun, you certainly won’t want to miss seeing the world that lives under the Seychelles’ shores. Many of the hotels dotted around the islands offer diving excursions and lessons – in fact, Maia in Mahé even goes as far as letting you learn to dive in your private infinity pool, so you’ll soon be plunging deep into the waters in search of colourful coral and fish. A bike ride is another fabulous way to really delve in to exploring the Seychelles. With only 25 motorised vehicles on the whole island, La Digue is definitely one of the best choices. The island is home to a traditional Creole village right on the beachfront, with lively, colourful restaurants, bars and shops, so you can spend a fun afternoon cycling along the road before stopping for a hearty helping of jack fish at The Fish Trap. For a scenic, jungle-clad bike ride, hop on your complimentary bike at Denis Island, taking the route that circles the whole of the island in one and a half hours – your hard work will be rewarded with gorgeous views of the white sand beaches and luscious forest. Of course being on an island offers an unbeatable setting for sunbathing on the beach. 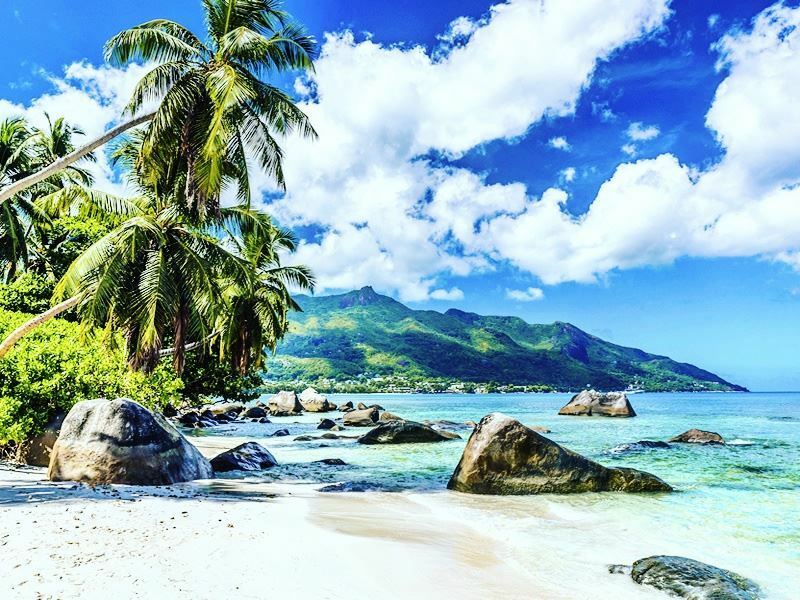 Seychelles is home to some of the most beautiful beaches in the world – they’re completely unspoiled and natural, with azure blue waters and powdery sands. 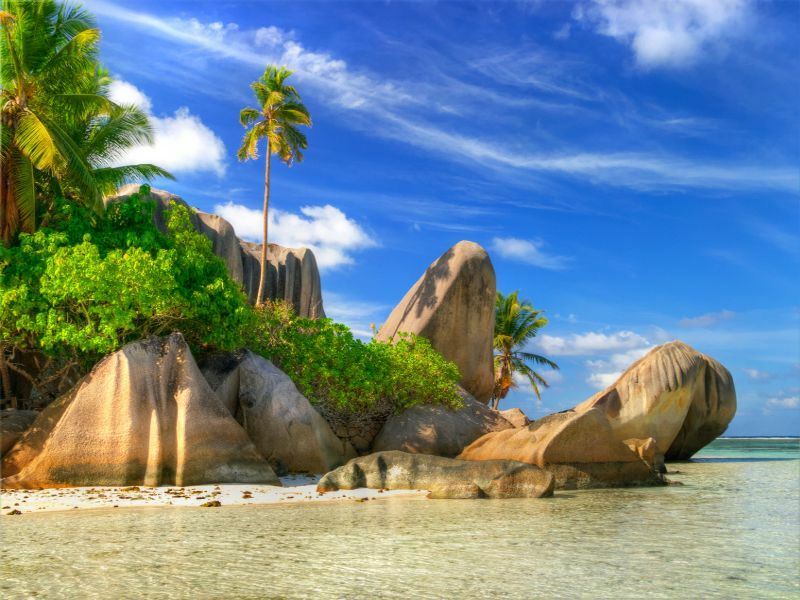 Anse Source d'Argent in La Digue is one of the most photographed and filmed beaches in the world – grab your flip flops to head here on a sunny day and you’ll see why. With gigantic granite rocks framing the shore, this picturesque beach is a treasure trove of little beach enclaves and coves, with plenty of secluded hideaways for you to relax and take in the tranquillity. There’s barely any development here, apart from a small tiki bar built with wood and serving a myriad of fruity cocktails. 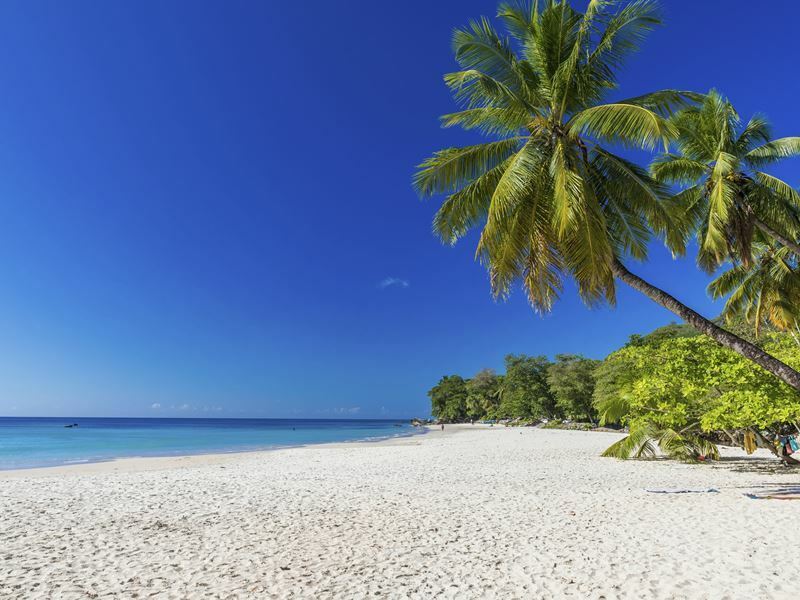 Anse Georgette, a pristine beach close-by to Constance Lemuria, is another stand-out spot for a peaceful afternoon with just the sound of the sea lapping on the shore. The two other beaches at Constance Lemuria are just as pretty, with a myriad of non-motorised sports and a cool bar, whilst Anse Georgette offers the simple life – with no sun loungers, bars or water sports in sight. If you prefer a beach with a bit of pizzazz and fun, Beau Vallon will certainly hit the spot. Nestled in northwest Mahé, this lively beach is a great base for snorkelling and diving, as well as being host to a myriad of local restaurants if you fancy exploring outside of your hotel. From the iconic white building of La Plage restaurant, to the local’s favourite pizzeria Baobab, you’ll be sure to find delicious, traditional food after an afternoon of swimming with the marine life. Later in the day, local fishermen and farmers come together to sell fresh fruit and fish under shady Takamaka trees, so be sure to grab a juicy papaya or two. Visiting the bustling capital city of Victoria should also be on your list for whiling away an afternoon. We say ‘bustling’, but it’s still nowhere as busy as the capital cities elsewhere, and not as touristy either – instead, it’s a small village with fascinating museums, gardens and attractions. Look out for the mini clock tower modelled on our very own Big Ben, as well as the vivid flora in the Victoria Botanical Gardens and the nearby gallery for local artist Georges Camille, or wander through Seychelles’ interesting past at the Victoria National Museum of History. For an insight into the local Seychellois lifestyle, be sure to saunter through the Sir Selwyn Selwyn-Clarke Market, a bright market full of fresh fish, fruit, and souvenirs. From water sports, museums and birdwatching, to nature reserves, hiking and delicious eateries, there’s plenty to do on each of the Seychelles’ islands. Or, of course, you could adopt the easy life with a holiday full of sunbathing. It’s your choice on your trip to paradise.